A Customer Journey Map is a powerful tool to understand and document the interaction of your customer with your product and service across various touch-points. Customer Journey Maps are a visual representation of customer interactions with your business, product, online experience, retail experience, or any combination. These maps are developed from a customer point of view, designed to highlight how customers interact with your brand, product, services, and people. The more touchpoints you have, the more complicated — and useful — such a map becomes. A Journey Map may focus on a specific interaction (e.g. a customer who visits your online store to buy a product, or a customer that calls customer service to solve an issue) or may take a broader view through several interactions (e.g. the decision to buy a new car may require an online search, a couple of visits to the dealer, a visit to the bank, etc.). Understand those moments of truth that have a significant impact on the customer experience. Identify gaps in the user experience when moving through the steps in the journey, interacting with different channels and touchpoints, or switching departments. Is the customer experience consistent? Are transitions smooth? Are there any gaps to fill? Create alignment among the team (and stakeholders) on the current pain points and the desired experience. Identify touchpoints and interactions among different actors. For example, in the case of car-sharing service Uber, the customer and the driver go through different experiences, yet they interact at multiple steps in the journey. A Customer Journey Map that overlaps the two actors helps identify the interactions and the respective points of view. There is no official format for a Customer Journey Map. A search on Google reveals that almost everyone uses a different format. It’s not just a matter of graphical representation. A Customer Journey Map is specific to a business, a user context, a specific moment, and these make it unique. There are, however, common elements that guide the creation of a Journey Map and make it a great tool to understand the customer experience. 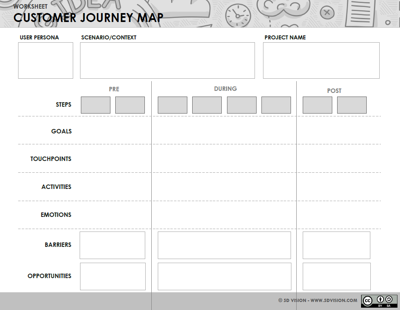 Download the Customer Journey Map template. You can create a Customer Journey Map after you have identified the types of customers that use your product. You can then map out their experience through your product or service, identifying the activities they do and the emotional responses they have at each step of the journey. Describe the scenario or context of the customer interaction you want to map out. What is the situation? What are the goals and expectations of the customer? When building a Customer Journey Map, it is important to have clarity of who the “Customer” is. Rather than using a generic customer segment, use a specific User Persona. What actions, needs, and motivations are specific to this Persona? You may have multiple User Personas, each one representing a different user type, with specific needs and activities. Create a Customer Journey Map for each of them to highlight different experiences with your product and identify possible intersections or gaps. Identify the touchpoints where the users interact with your product or service. A touchpoint is any point of interaction a user has with your business: a search page on the website, a checkout kiosk, a call to the customer service. These can be your current touchpoints if you are creating a Journey Map of the existing experience, or your future touchpoints if your product does not exist yet or you are planning an extension. Every journey starts with the first step. To create a Journey Map, you need to identify the steps a user goes through in experiencing your product or service. The touchpoints identified above are a great start, but you may not want to stop there. You should highlight all the important steps the customers go through that are important in defining their experience. Some of these steps may be outside of your direct touchpoints: realizing they have a need, searching for information on Google, asking a passer-by for directions. By mapping these additional steps, you define the customer’s journey in more clarity, and identify additional points of interaction with your customer that are not yet represented by current touchpoints. A useful approach to define your steps is to think about the possible “moments that matter” a user may go through from the initial understanding of a need, to the resolution of that need with your product or service. Think With Google defines these as micro-moments and organizes them in four categories. Think about any of these “micro-moments” that are important for your customer’s experience and add them to your Journey Map. Finally, the steps should be defined based on the customer’s point of view, not your internal business processes. Once you have identified the possible steps in your customer’s journey, sort them in linear progression. The usual approach is to place them on a horizontal line at the top of a whiteboard, leaving space below each step for the details of the Journey Map. Goals and expectations: What is your User Persona’s intent at this step? What is it aiming to achieve? What does it need? Touchpoints: How does the User Persona interact with your product? What are the touchpoints at this step? Activities: What does the User Persona do at each step? Emotions: How does the User Persona feel at each step? What emotions does it show at each step? Is it happy, frustrated, curious, sad, excited? Typically, when building a Journey Map, we focus mainly on the core experience, the steps that customers go through while using the main features of our product or service (I call this the “DURING” phase). However, the user experience often starts before the actual interaction with the product or service, or it may extend past what the product offers. I call these the “PRE” and “POST” phases. They identify steps in your customer’s experience that take place before and after the core experience offered by your product. By looking at the “PRE” and “POST” experiences, you can identify other possible touchpoints and opportunities to extend your product for a richer and more satisfying experience. 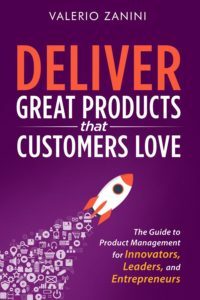 You can learn more about Customer Journey Maps and other product management tools in the book: Deliver Great Products That Customers Love.